Alstom and Ferrovie dello Stato (FS), the holding company that manages infrastructure and services on the Italian rail network, celebrated the 25th anniversary of Pendolino at Milan's Central Station in Italy. To mark the special event, Alstom, represented by Pierre-Louis Bertina, managing director, Alstom Transport Italy, offered the original patent of the first model to the FS Foundation represented by Mauro Morretti, managing director, Italian railways. Part of Alstom's high-speed train offering, Pendolino is designed to run on both high-speed and conventional lines. With around 500 trains sold worldwide, Pendolino is the world's best-selling high speed train, according to the company. Pendolino is certified to operate in 13 countries, including cross-border journeys. Its success rests on its modularity and flexibility. Pendolino can be fully customized from interior layout to the number of cars (three to 11), voltage power supply, gauge and suspension. It offers flexible configurations, allowing all passengers to travel comfortably, thanks to its catering facilities and areas for children, wide corridors and gangways offering optimal accessibility and comfort, passenger information systems, and large panoramic windows allowing passengers to benefit from natural light and enjoy the scenery. Pendolino can be operated under extreme climate conditions (up to 45° and -45°C). It is also available with Tiltronix, Alstom's tilting technology, which enables the train to tilt by up to 8 degrees, allowing it to travel 30 to 35% faster than conventional trains. 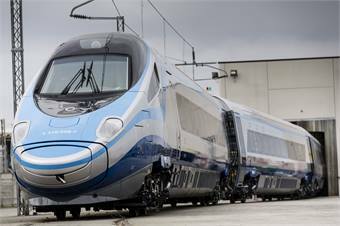 Pendolino is mainly produced at Alstom's Savigliano factory in Italy.